Though the game has been out for a while on Nintendo Switch digitally, YouTubers Life OMG! Edition is now available to purchase digitally in stores across Europe. Want to become a successful Gamer with your own gamer channel? perhaps you want to be the next musical sensation with your own Music Channel? Well you can in YouTubers Life OMG! Edition. Who knows, perhaps the tips in the game will help in real life? In fact, I might even give it a try myself. We have the official announcement from Raiser Games and U-Play below. 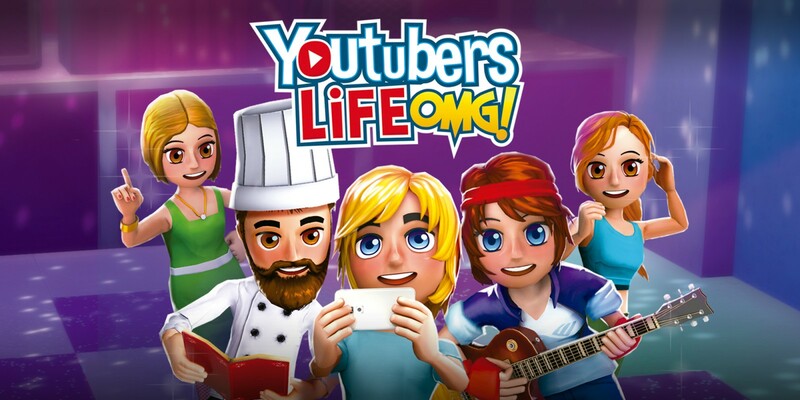 April 5, 2019 — Raiser Games and U-Play today released Youtubers Life OMG! Edition for Nintendo Switch in stores across Europe. This physical edition has been long-requested by its fans, but that’s not all – to celebrate this release, Youtubers Life OMG! is receiving a major update on Nintendo Switch which includes many quality-of-life, gameplay, and balancing improvements. For instance, while at your parents’ house, you will start monetizing your videos as soon as you get to 500 subscribers… but if you fail your tests at school too often, they will kick you out – so make sure you study enough… or that you can earn enough money from your channel for you to move to your own place! In Youtubers Life OMG Edition!, players create videos, get subscribers, attend events, interact with fans and grow their channels. You will launch your new venture from your parents’ house and gain your first subscribers, views and likes, but soon you’re well on your way to fame and fortune as a popular influencer. Meet other well-known Youtubers, go to the wildest parties, share your life through social media and deal with your haters. Monetize your content, sign with exclusive networks and customize your place with the coolest stuff. Grow until you can afford a mansion in outer space! Both longtime fans and newcomers will enjoy tons of features that offer an immersive, dynamic experience on their path to stardom, including an interface designed especially for consoles. Players will find realistic social interactions, from NPCs who may offer quests, active relationships with social media followers, and viewers whose morale may suffer, if you don’t respond to their wishes. Interaction with collaborators and networks can boost your productivity… or create fresh problems. The integrated task system helps keep the savvy Youtuber on top of everything.